We check over 450 stores daily and we last saw this product for $62 at Bebe. 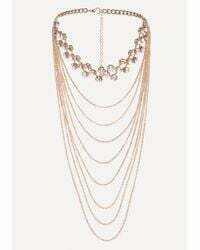 Glittering crystal choker accented by liquid layered chains. 90% Metal, 10% glass. Lobster clasp closure.